I stumbled upon this interesting article from the New York Times which links to an analysis performed by Danish statisticians on the non-elite finishers of the Amsterdam, Athens, Berlin, Boston, Budapest, Chicago, Frankfurt, London, Madrid, Marine Corps (Washington), Paris and Warsaw marathons, between 2009 and 2014, and then determined which were the fastest nations by average finishing time. A new analysis of more than a million recreational marathon participants at major marathons around the world finds that the world’s swiftest amateur marathoners do not share the same nationalities as the world’s elite racers, many of whom come from East Africa. 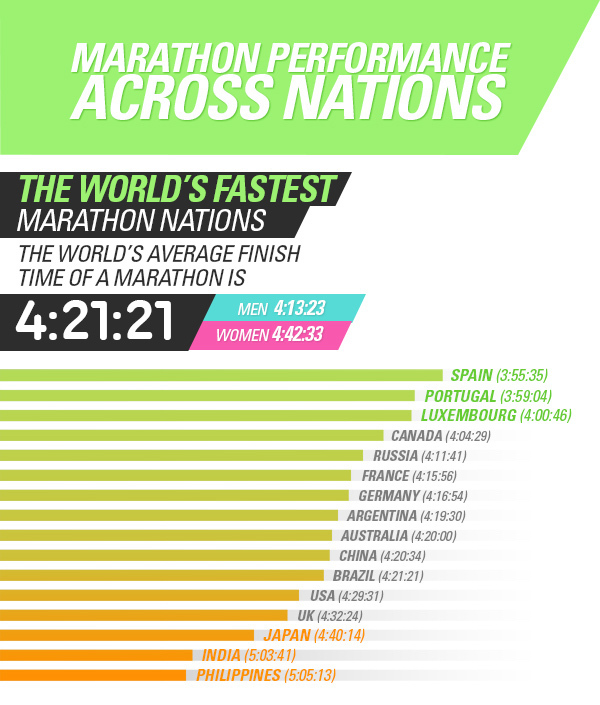 In terms of average pace for its runners, the United States sits near the bottom of the nations included, vastly trailing that marathon powerhouse, Iceland. "Many see Africa as the marathon continent, but they only dominate in the elite scene," says Jens Jakob Andersen, a runner and statistician in Haderslev, Denmark, and the lead researcher for the new analysis. "In recreational running, it is not a popular sport."" … however, as I see it, the data isn't really representative of the world as a whole and as such doesn't fully support the comments and conclusions made. Whilst the analysis has been performed on some of the largest and most popular marathons in the world, they're mostly concentrated in Europe with a few from the US. Not a single African, Asian or Asia-Pacific race has been included in their analysis thus skewing the results. This is particularly pertinent as it is considerably more expensive to travel from Africa, Asia or Asia-Pacific to Europe and the US than it is to travel in-and-around Europe or from Europe to the US and vice-versa. Performing a similar analysis of just marathons in Japan, China, Australia and New Zealand would lead to heavy weighting towards nations on that side of the world. From my experience, races only register the nationality of runners if they enter via the international registration process. This leaves out all those who may be living temporarily or permanently in the country of the race in question but still identify themselves as being from another country. These two points dramatically cut down on the diversity of the results and limits entries from African, Asian and Asia-Pacific countries to those that are wealthy enough or who have been sponsored to travel to the countries of the races studied. To me these points also significantly water down and possibly invalidate the claims being made. It's also not clear what they classify as an "elite" runner. I run sub-3 hours but don't consider myself elite… far from it. By London Marathon standards I don't even qualify for the championship start which is for the super-fast club runners. I doubt this will affect the results much, but it would have been nice to know this. I'd love to see this analysis performed again using a number of races with similar sized fields from many more countries and then see how this compares to the elite performances. I suspect we'll see African and Asian countries ranking much higher than they do here.